Sorry for your loss but that sounds like one hell of a beer festival! I see what you did there - the answer is 42, or very nearly. Hope you enjoyed our new site and found plenty to drink. I ran into this when I got an iPhone replaced while in the US. The 'Price' column is a notional price for the line item -- I'm not sure if it's the internal cost or the retail price, but I assume the latter -- while the 'Amount Due' is what they actually intend to charge for it. In my case, the retail cost of the repair service was $299, and that showed up in the Price column, but the repair was handled under warranty with $0 in the Amount Due. This was totally confusing until I asked the store rep to explain it! £207.50 + 20% = £249. It's clear that somebody's neglected to consider VAT… I wonder if the undiscounted price is £249. Yes, apple in store are very good at forgetting about VAT. Apparently their back office guys only see the non vat figures, which is misleading - consumers don't expect non VAT figures. It is illegal in the UK to quote non VAT prices to consumers. Someone should tell Apple, and whoever is supposed to take Apple to court for breaking the law. I would conclude that they just haven't given you the promised discount if they debited you £249.00. Surely the left-hand column is the standard price and the right-hand column is the discounted price for replacement machines? 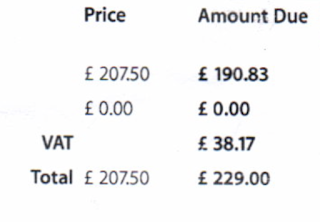 They appear to have charged the standard price + VAT instead of the discounted price * VAT of £229.00. 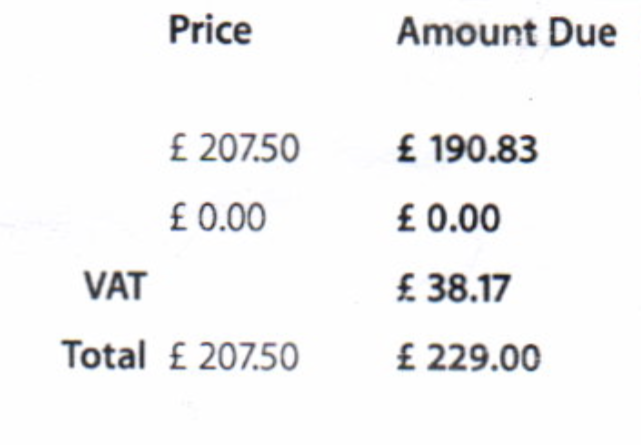 In other words the discount (after VAT is added) should be £20 but you've been charged as a new customer.